Industry pros anticipate more deal volume in 2012. The exclusive online survey conducted by Southeast Real Estate Business concluded that as a whole, there is a sense of cautious optimism that business will pick up in 2012 compared to 2011, although recovery will continue to be slow. In the broker survey, respondents were asked if commercial real estate values in the Southeast have hit bottom. More than half of the respondents (52.3 percent) indicate recovery in the Southeast is spotty, varying by property type and location. Moreover, 30.5 percent say values have hit bottom, and 15.6 percent believe it has not yet seen its lowest point. See Broker Opinions of Value. Of the respondents to the developer/owner/manager survey, 44.9 percent intend to be a net buyer of commercial real estate properties in 2012, compared to 22.4 percent who plan to be a net seller. Additionally, 17.9 percent do not plan to sell or buy, and 14.7 percent were uncertain. See Buy, Sell Or Hold. Those who intend to be net buyers cited retail grocery/drug-anchored centers as their most desire asset at 42.1 percent. Other sectors including multifamily (32.9 percent), retail single tenant (27.6 percent), mixed-use (22.4 percent), and retail lifestyle/power centers (21.1 percent), are also of interest to buyers. Conversely, the two most common assets net sellers intend to dispose of are retail single tenant (30.4 percent) and multifamily (26.1 percent). Additionally, suburban office and retail grocery/drug-anchored centers tied at 21.7 percent, and industrial and student housing were both 13 percent. “Retail grocery/drug anchored centers remain the preferred asset class for investment because of the strong credit associated with a grocery/drug anchor and the resilience of these centers in a down economy,” adds Garrison. More than half (59.3 percent) of developers have projects in the Southeast in their development pipelines that will break ground next year. More than three in 10 respondents (33.3 percent) indicated they will build retail single-tenant, followed by multifamily (27.8 percent), mixed-use (20 percent), retail lifestyle/power centers (17.8 percent) and retail grocery/drug-anchored center (15.6 percent). See Shovel-Ready Projects. Another interesting result of the survey was that 30.7 percent believe their negotiating leverage with retail tenants will be stronger in 2012. More than four in 10 respondents (47.1 percent) believe their negotiating leverage will be the same, 12.1 percent thought it would be weaker and 10 percent were uncertain. “We continue to see strong demand from national tenants for well-positioned retail projects throughout the Southeast and expect to see a continuation and acceleration of this trend in 2012,” says Garrison. For office and industrial leasing, respondents were hesitant, with the highest responses stating it would either be the same as 2011 or uncertain. For office tenants, 38.7 percent of respondents believe negotiating leverage with will be the same in 2012, while 24.4 percent were uncertain. In negotiating leverage with industrial tenants, 42.1 percent of respondents were uncertain whether it would be stronger, weaker or the same, and more than three in 10 respondents (31.8 percent) anticipated their leverage would be the same. Of the lender respondents, three-fourths (76.6 percent) expect the total dollar amount of commercial and multifamily loans closed by their firm to increase in 2012, while 17 percent thought it would remain the same and 6.4 percent thought it would decrease. More than one-third of respondents (38.2 percent) anticipate lending activity totals will increase by more than 20 percent. See Projected Growth In Loan Volume. There are many factors impacting the debt financing market for commercial real estate. A little more than half (54.2 percent) of respondents indicated that the health of the U.S. economy would have a high impact on the debt financing market in 2012. In addition, 48.9 percent believed valuations for commercial real estate would have a high impact as well. Additionally, 61.7 percent of respondents believe the fate of Fannie Mae and Freddie Mac will have a high to extreme impact on the debt financing market during the next 12 months. A little more than half (53.2 percent) of the respondents indicated the state of the CMBS market will have a high to extreme impact. More than one-fourth (27.9 percent) of respondents project total domestic CMBS issuance in 2012 will fall between $30 billion and $39 billion. Additionally, 25.6 percent believe CMBS issuance will be less than $30 billion, and 20.9 percent project it will land between $40 billion and $49 billion. Only 2.3 percent of respondents anticipate CBMS issuance in 2012 could be more than $100 million. See Securitized Lending Outlook. In the Southeast, lenders indicated they are most bullish on multifamily properties. Eight in 10 respondents (81.6 percent) cite multifamily as the property category with the most attractive investment opportunities in the Southeast. Nearly six in 10 (57.1 percent) believe retail grocery/drug-anchored centers are good investments and 55.1 percent indicate medical office is desirable as well. See Favorties of Finance Community. More than two-thirds of broker respondents (64.6 percent) expect their firm’s total transaction volume by dollar amount (leasing and investment sales combined) in the Southeast to be higher in 2012. Additionally, 27.8 percent believe transaction volume will be the same and 7.6 percent believe it will be lower. See Broker Outlook for Deal Volume. Three in 10 respondents (32 percent) who believe transaction volume will increase, thought it would do so by 5 percent to 10 percent, while one-fourth (25.2 percent) believe it rise by 11 percent to 15 percent. See Projected Growth in Brokerage Activity. Two-thirds of respondents (64.3 percent) believe the multifamily sector will experience high velocity in sales in 2012. Other popular property categories include retail single-tenant (34.9 percent), medical office (33.3 percent) and retail grocery/drug-anchored centers (27.1 percent). Conversely, 43.5 percent of respondents believe retail mall properties will experience a low velocity of sales in the Southeast next year. Downtown office was a close second with 41.1 percent, followed by suburban office at 39.5 percent. See What’s Hot, What’s Not On Sales Front. 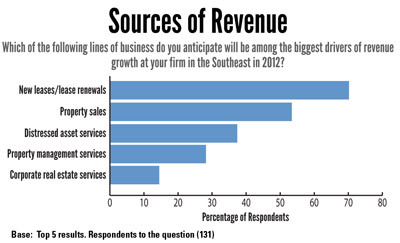 When asked which lines of business will be among the biggest drivers of revenue growth at their firm in the Southeast in 2012, 70.2 percent of respondents cited new leases and lease renewals. More than five in 10 (53.4 percent) indicated property sales and 37.4 percent pointed to distressed asset services. See Sources of Revenue. For office leasing, tenant improvements/build-out allowance (69 percent) and base rent (61 percent) are the two biggest sticking points between owners and tenants. Of the respondents, 69.2 percent indicate the health care industry will drive office leasing growth in 2012. Additional potential growth sectors include technology (35.9 percent), biotech (32.5 percent) and financial services (25.6 percent). The retail results were similar to office in that nearly six in 10 (59.3 percent) say tenant improvements/build-out allowances are the biggest sticking point between owners and tenants for retail lease negotiations, and half of respondents (50.4 percent) say base rent is an issue. Interestingly, 17.7 percent selected other and several commented that co-tenancy clauses have been a sticking point. For industrial leases, base rent is the biggest negotiating point, say 64.9 percent of respondents, and length of the lease follows with 47.4 percent. Although the market in the Southeast has shown some improvement, there is still a divide on how the commercial real estate community feels entering the new year. “In 2010 and 2011, it was very challenging to do any new development. [We are] hoping and planning for 2012 to be a better real estate development market,” says an undisclosed respondent. ©2012 France Publications, Inc. Duplication or reproduction of this article not permitted without authorization from France Publications, Inc. For information on reprints of this article contact Barbara Sherer at (630) 554-6054.